In Color Order: Cool Breeze Bundle Giveaway! Julie at The Intrepid Thread asked me to put together a bundle for her shop, and I couldn't resist! Putting together fabrics is my favorite part! I've really been drawn to purple lately, so here is the bundle I came up with, the Cool Breeze bundle! You can find it as a fat quarter bundle and a half yard bundle! Cool Breeze Bundle @ The Intrepid Thread!, a photo by jenib320 on Flickr. We've got a Cool Breeze Fat Quarter Bundle to give away to one of you! To enter: Just leave a comment! International entries are welcome! Make sure your email address is viewable in your profile or you include it in your comment. Giveaway will be open until Monday at 5pm CST. Winner will be chosen with random.org. Good luck & Happy Friday! I love Intrepid Thread! And your bundle is gorgeous! What a beautiful fabric bundle! My favorite right now is the woodlands bundle in blue! As for my favorite item, I'd have to go with the teeny mushrooms in A Walk in the Woods. So adorable! I'm loving the Poetica. Love the Seafoam in that. Yum. Oh my ... am in love with the bundle! We just moved into a new house and am thinking about doing our bedroom in purple ... So the bundle will get used for sure! Wow what gorgeous fabric!! Love it! Thanks. Thanks for doing this. Intrepid Thread has the best website now. Love the large pictures. Purple is my fav color. . and this bundle is lovely! loving purple these days too!! beautiful bundle! Great bundle. I think I need help in grouping. Contrast is the hard part for me. Does it count I just got some FMF from Julie? I la la lovely it! Another line that I'm loving is the pezzy prints. . YUM. Thanks for the giveaway my dear. Love the purples and aquas together! My new favorite combination at the moment! Happy birthday again! great bundle choices! So Pretty! I love it all, but especially Poetica Serenade. I have always loved purple. When I was a little girl, my room had purple carpet! The Cool Breeze bundle is beautiful. Beautiful bundle, cute Bunny and gotta love a girl that celebrates her birthday all week! Happy Birthday! great bundle! i always struggle to add purples to the stash but your stack looks great together. And im really loving the Summerlove collection. Julies Summerlove in Blue Crush is perfect! These fabrics are gorgeous. Happy Brithday, mine is next Wednesday! i just love that woodland tales bundle in blue. I love the purples in this bundle! Thanks for the giveaway! 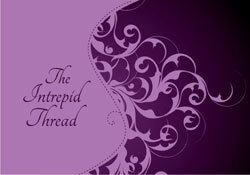 the intrepid thread is new to me - yeah!! I love the cream to curry yellow bundle - so sweet! and over at Intrepid Thread it's a toss up between Lucy's Crab Shack and Peak Hour! I love the color pallette. I'm not usually attracted to purple combos. This is a lovely grouping! I've been drooling over this fabric for a while now. I just made a big purchase but I really want this still. Cosmos or Poetica are my favorite. I love this site. I really like the Summersville designs, which you don't see anywhere else and several of the soon to be released lines. I need to shop. Happy Birthday! Thanks for the chance to win this great bundle! Nice work! I think cool breeze is a perfect name for this :) Thanks for the chance to win! My favorite bundle in the shop is Fruit Slice! Love the bright colors! This bundle is beautiful, purple is my favorite color! I'm torn between the Fruit Slice bundle and the Impressions bundle in her shop. Thanks again for the chance! Love the Cool Breeze colors - they are my very favorite! Have a great rest of your birthday week. What a wonderful fabric collection..I see your large star tutorial in those colors, now I will dream about it.Great giveaway! Thanks Jeni! I love her new cabana collection! I LOVE this bundle - it is one of my favorite faberic bundles I have seen in a while. Thank you for pulling it together (and for the chance to win it!). My favourite is the Poetica - sweet melody! wowzers! that is an amazing bundle of color--I love it! I need more fabric! I've been destashing but hoarding is so much more fun. The Poetica complete collection at Intrepid Threads really caught my eye! I also really like the Impressions blue and teal bundle. OH, the new Flock line is very difficult to resist!! Amazing fabrics...I like the purples with the aquas. Great choices! Cosmos 1/2 yard bundle in Vermillion, that's what I would get, if I had that much money. Wait, how much was it? I never would have thought to pair purple with aqua, but it is lovely! Thanks for a chance at some of this yummy fabric! If I had to choose one bundle from Intrepid Threads it would be Cream to Curry. I am also in love with the "Hello Pligrim" fabrics:) They are so Spring like and vibrant!!! my purples are severely lacking - and this is a beautiful bundle! Beautiful bundle. It needs to become a quilt draped on a porch swing. Figures...I really liked the Sommersville Town in Coal by Lucie Summers...and it's out of stock...for now only, I hope. Woodland Tails in Green half yard bundle really caught my eye! I think I'd pick that or any one of the charm packs as my favorite item. What a beautiful bundle! Thank you for the chance to win. Great bundle, I love the cool colors! I love the bundle you've put together. Thanks for a chance to win. LOVE the bundle you put together. I'm really into blues and purples right now. Throw in some lime green and I'm a happy camper. I love The Intrepid Thread shop. Cosmos is my favourite line at the moment. Must get some!!! My favorite line at Julie's shop is the Summerville in the section 'coming soon'. Such lovely colors and designs! i'm really digging the maya fat quarter bundle from julie's shop! I'm loving the Summerlove fat quarter bundle! All those pale blues and oranges are so pretty! Just beautiful! Thanks for the chance to win! hanks for the giveaway! And Happy Birthday. Favorite fabric collection is A Walk In The Woods by Aneela Hoey for Moda. I love The Intrepid Thread. Cabana Blooms is my favorite new line in the shop. I am loving the Pezzy Prints right now! Thanks for another great giveaway Jeni. I hope you have had a wonderful birthday week and that you have been spoiled like you are spoiling us! I love the special attention Julie gives you, even when she was on vacation she tried to help me out. This is a dreamy bundle - oh! would I love to win it!! Thanks for the chance!! Cabana Blooms - Paisley in Grey really caught my eye. It's so pretty! Cool Breezeeee makes me feel fine! Exploring all the Jasmine in my Minnnnnnd. LOVE. XOXO. Poetica - Serenade in Daylight is the name it, lovely print. And i'm also loving Cocoon - Large Butterfly in Stone, Large Floral in Stone,Butterfly in Bamboo, Damask in Hyacinth, Cocoon in Lead all coming in April......and Lucy's Crab Shack is just the cutest with text prints and plaids love them. Oooh, and I love the Summerlove bundle. Such gorgeous colors! Gorgeous bundle! I would love to add it to my stash! I just bought a ton of Riley Blake Peak Hour from Julie, I have been waiting for it to come out since I heard about it in November. Love it, it will be perfect for my boys' big boy bed quilts. I love the purples! This bundle is so aptly named and beautiful! Thank you for the chance to win. My favorite bundle would be Cosmos in azure. I love that collection! Purple is on my radar right now - beautiful. Fantastic colors! Thank you for a chance to win. Your bundle is beautiful - you have a real gift for creating color combos! Thanks for the chance to win and Happy Birthday!! Thi si an absolutely gorgeous bundle! Love it! Thanks so much for a chance to win! Thank yo for chance to win. I love in the coming soon section the Santa clause is coming to town. I just found the Peak Hours - Ads fabric. It is just adorable - classified ad for trucks and vehicles - perfect for a little boy quilt!!! I esp. love the new line 'vintage modern', fantastic colors and designs. My favorite in Julie's shop is the Flock complete fat quarter collection! Great picks! Love these cool, bright colors! I love the poetica bundle! thanks for the chance! I have a purple lovin' daughter, this could be the start of a new quilt for her. I love your blog, thanks for sharing the giveaway! I'm loving the Summerlove - Half Yard Bundle In Blue Crush by Pat Bravo. I love the Poetica bundle in Seafoam Symphony also! Love these aqua/purple bundles! Thanks for a chance to win! What a gorgeous bundle you have put together! So lovely! What a great bundle! I love all shades of purple. VISITED JULIE! MY FAVORITE BUNDLE IS "A WALK IN THE WOODS"! THANK YOU FOR SHARING A GREAT GIVEAWAY! I LOVE the poetica in seafoam symphony bundle! I just love anything by Pat Bravo. Love this bundle and LOVE Julie's shop! I'm so glad she opened up. My stash is particularly lacking purple- which is strange, since it is my favorite color! What a great bundle! I love The Intrepid Thread. This bundle is gorgeous! Thank you for the chance to win. I love the purples in the collection! My favorite fabric is the Power Pop Confetti in Freesia! So spring! Wow Jeni, you put together such a beautiful bundle! Thanks for the great giveaway! Beautiful color palette! Thanks for the giveaway! You put together a really beautiful bundle. Today was my first visit to The Intrepid Thread and I'm hooked! Gorgeous bundle, they would definitely enhance my stash :) Great giveaway! Love the fabrics, and love this shop. Great customer service! I like the "peak hour" line~ I would get some of that! I love the new Kate Spain line, Good Fortune. Love this fabric and would love to win this bundle! Pretty purples! I don't have much of that color in my stash, this would be perfect to add. I'm loving the Summerlove bundle over at the Intrepid Thread. My favorite bundle in the shop would be the fruit slice, I think. So many lovely bundles at the Intrepid Thread, so difficult to choose. My current favourites are the yellow FQ bundle From Cream to Curry and the Poetica FQ bundle in Seafoam Symphony, but that might change next time I am shopping! The customer service from Julie is excellent, I cannot recommend her store highly enough! I wouldn't have thought to put the purple and teal together - but this stack is gorgeous! Thanks for the great giveaway and happy birthday! Wow!! thank you, This is a beautiful bundle you have put together for us....stunning!! Nice. I need more purple fabrics. My purple stash is looking pathetic! Your purples speak to me, birthday girl! Ooh, yum. My stash is low on purple, so I'd love to win this! Happy birthday!! OMG that is a lovely bundle. I am really digging the turquoise /mint colour at the moment and purple is great with it. This bundle is too peaceful and serene. I really LOVE this patterns and color combinations. Maybe i´ll be lucky today??? I love the Desert Daydreams bundle! I love purple! Thank you giveaway! greetings from Hungary! I love woodlands bundle. very ,very nice. That's a really beautiful collection of fabrics! I have really been crushing on Fruit Slice by Khristian A. Howell lately...so that is my favorite bundle. I love the name for this pretty bundle. Very fitting. I really like Summer Love. Happy birthday to you!!!! Lovely fabrics!!! My stash is very thin on purples so this bundle would be a great addition! Thanks for the chance to win. My favourite bundle might be the Cream to Curry yellow bundles. I love yellow, but seem never to buy much of it. You know I think your bundle is my favourite, either that or Verona - Main in Grey. love that bundle! and my little girl looks super cute in purple! I like lots of things at The Intrepid Thread but today my favorite is the Fruit Slice bundle. Gorgeous! What a great combination: You and Julie. I love your sense of color and Julie is my favorite favorite fabric lady. Beautiful bundle with some of my favorite colors. Thank you!